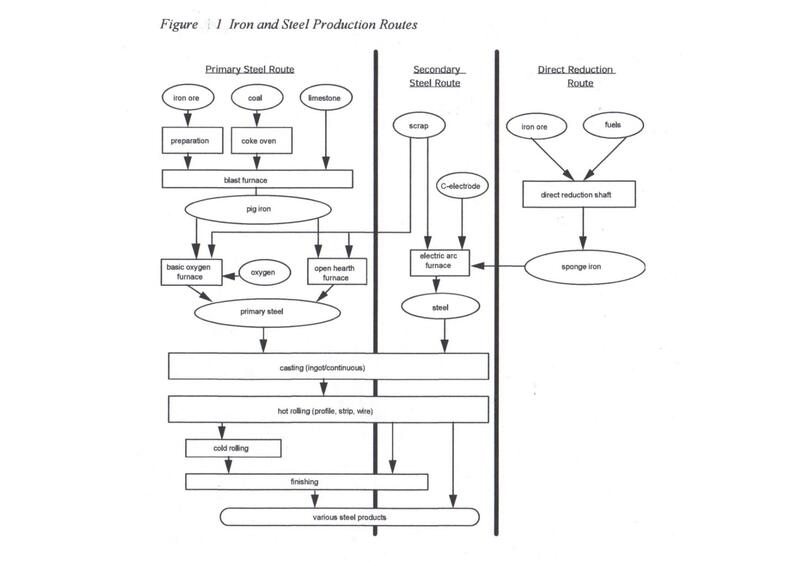 Steel comes from iron, which in turn is from iron ore "reduced" with metallurgical coke (from coal) as a reducing agent and with limestone as a flux. Coal provides 70% of the energy needed, with the rest coming from fuel oil, natural gas and electricity, also partly derived from coal. When coal is used to produce metallurgical coke, there are the by-product fuels of blast-furnace gas, coke-oven gas and coke breeze which are used internally in the processes. An alternative to coal would be charcoal made from wood or petroleum coke, but the size of the industry means it is mainly dependent on coal. Reference to BP's Statistical Review of World Energy 2010 reveals proved coal reserves totalling 826 billion tonnes, which at the current rate of production of 6.94 billion tonnes per annum will presumably last 119 years (R/P ratio = 119). The coal is rated under two categories, 411 billion tonnes of 'anthracites and bituminous' and 415 billion tonnes of 'sub-bituminous and lignite'. However, around 85% of coal production is bituminous, so that with production of 6.94 x 0.85 = 5.90 billion tonnes /annum from them, global reserves of ‘anthracites and bituminous’ will last only 411/5.9 = 70 years. Anyone visiting East Germany before 1990, will have smelt the sulphurous tang of "brown coal" briquettes made from lignite (heating value 15-19 MJ/kg), which kept the populace warm. Sub-bituminous coal (20-28 MJ/kg) is little better than lignite, containing 20% to 30% moisture by weight. Bituminous coal (27 MJ/kg) contains bitumen, while the most desired is anthracite which has the highest carbon content. (heating value 27-30 MJ/kg). Metallurgical or coking coal is used to produce metallurgical coke. The coke is produced in sealed, oxygen-free ovens and used in blast furnaces in standard iron smelting for steel production. Coke is made from bituminous coal (sometimes blended with up to 1 percent anthracite). It must be low in sulphur and must "agglomerate," to produce a strong, porous, and carbon-rich fuel that can support the load of iron ore in a blast furnace. Coal for metallurgical use requires more thorough cleaning than for steam uses. The reduction of the iron ore to iron requires high quality coke produced mostly from the bituminous coal blended with anthracite. The biggest reserves of bituminous coal are in the United States which holds around 109 billion tonnes of it, but there remains only a modicum of anthracite. The US has 25% of the world’s ‘anthracite and bituminous’ reserves, i.e., 109 billion tonnes of the 411 billion tonnes. With US all coal production of 973 million tonnes/annum and assuming 85% of that extracted is bituminous, at current rate of 827 million tonnes/annum US ‘anthracite and bituminous’ reserves will last but 132 years. However, the amount of US anthracite has declined to around 60 million tonnes of reserves with around just1 million tonnes a year of production. Production from Novosibirsk in Siberia is growing to around 6 million tonnes. Vietnam, China and Russia are the main suppliers. This means that to prepare blends for ironmaking, the US will have to import a growing amount of anthracite. Iron ore, used directly as lump ore or converted into briquettes, concentrates, pellets or sinter is the only source of primary iron. Ferrous scrap can make up to 7% of blast furnace feedstock, but is used mainly in steelmaking. (USGS). The world reserves of iron ore amount to 160 billion tonnes containing 77,000 billion tonnes of iron. Five countries, Ukraine, Russia, China, Australia and Brazil hold 70% of the reserves..
Iron ore reserves of 160 billion tonnes (77 billion tonnes of iron) would at current production last for 70 years (i.e., an R/P ratio of 70). This corresponds to the 70 years of bituminous coal production left at the world’s current rate of 5.9 billion tonnes/annum (i.e., 85% of 6.94 billion tonnes/annum), so it can be concluded that in aggregate ironmaking can at best endure for the same 70 years. Obviously those countries with the largest coal and iron ore reserves will maintain their iron production for longer than those without. As it takes around 1 tonne of coal equivalent to produce 1 tonne of iron, the limiting factor is the iron ore rather than coal (77 billion tonnes of iron vs 411 billion tonnes of bituminous coal), as a greater proportion of bituminous coal could be devoted to ironmaking than say to electricity generation. The initial ironmaking process is to remove oxygen from the iron ore by heating it with coke and limestone to a temperature of about 1600° C in a blast furnace. After reducing the iron oxide the resultant material is pig or cast iron, which is brittle. Some carbon remains in addition to other unwanted elements and these must be reduced by further refinement before the material becomes steel. The carbon content of steel is crucial to its strength and is usually lower than 2.11%. A controlled system of oxidisation is used to manipulate the carbon content. Other impurities must be removed from the melt in order to achieve the correct composition. Plain carbon steels are those in which the only other element remaining is manganese. (Corus). World iron ore production in 2009 was 1.6 billion tonnes, from which 952 million tonnes of iron was made. Ferrous scrap contributed around 500 million tonnes and taking into account processing losses there was 1.22 billion tonnes of steel produced. It seems that in 2009 some 1.25 billion tonnes of the 5.9 billion tonnes of global ‘anthracite and bituminous’ production, i.e. about a quarter of it, was devoted to ironmaking. Apart from some open hearth steelmaking still in operation, there are two main processes, basic oxygen conversion (BOC) and electric arc furnace steelmaking. Electric arc furnaces are normally fed with 100% scrap, but this can be supplemented with sponge iron made from the direct reduction of sintered ore pellets. The iron ore is in the form of pellets and is subjected to a reduction process with the use of a reducing gas extracted from coal or natural gas. Both need the addition of scrap as an essential component and supply problems could in future lead to a production limitation. The proportion of scrap in steelmaking can vary from 100 kg/tonne to 300 kg/tonne. Because the scrap is already reduced, its use reduces the amount of coke needed by substituting for some of the pig iron in the oxygen converter and thus the energy consumption. The need for a proportion of scrap tends to restrict output growth as its requirement increase can exceed the capacity of the recycling to match it. Specific energy consumption for steel in a developing economy it linked to the amount of scrap it is able to import, the greater proportion of scrap the lower the specific energy. The world average specific energy is around 23 GJ/tonne (23 MJ/kg), which agrees roughly with the figure of 1 tonne of bituminous coal per tonne of steel slabs, billets and blooms, given that the heating value of bituminous coal is around 27 GJ/tonne (27 MJ/kg). When considering the energy return on investment for off-shore drilling the energy consumed when manufacturing the steel utilised is of interest. It thus depends on the quantity of steel components. A typical drillship has a deadweight of 100,000 tonnes, while an FPSO can be 300,000 tonnes, carrying 40,000 tonnes or 120,000 tonnes of cargo respectively. The cargoes of both will consist of the drilling equipment, drill string pipes, drilling mud and the recovered crude oil with diesel fuel. Both will hold processing equipment for the separation of gas from the oil, while the FPSO may well have a liquefaction facility for gas to LNG, so that an undersea gas pipeline is avoided. While the FPSO will be moored in a production position, the drillship is GPS positioned dynamically by thrusters, using 5000 hp seawater pumps. To evaluate the amount of coal needed for a barrel of oil extracted it is necessary to schedule the off-shore activities. and relate them to the actual production achieved. Off Brazil, Petrobras intends to deploy 53 drillships, 84 FPSOs, 85 other rigs and 500 special ships by 2020. This adds up to around 50 million deadweight tons of floating items, while assuming the steel contents, of pipe strings, BOPs and ROVs are turned round annually, some 20 million tonnes a year of steel items for ten years will be consumed, i.e., from 2010 to 2020 250 million tonnes will be needed. From 2010 to 2020 the Brazilian additional oil and gas production is to rise to 5 million barrels a year of oil equivalent or 2.5 billion barrels over the ten years. The coal requirement works out at 250 million tonnes of steel products for producing 2500 million barrels, or 100 kg coal per barrel of oil equivalent. With bituminous coal having a heating value of 27 M/kg, the energy needed to manufacture the steel consumed is 2,700 MJ/barrel providing 6,100 MJ/barrel of heating value in the crude oil. After 2020, there will be a residual inventory of ships and other steel goods able to continue to find oil, so the 2,700 MJ/barrel can be seen as energy capital, but nevertheless will be expended over the 2010 to 2020 decade. So the 1.25 billion tonnes of coal a year devoted to iron and steelmaking multiplied by 10 barrels/tonne of coal, means that 12.5 billion barrels of oil equivalent a year is the world’s off-shore production limitation. The energy needed for the steel consumption is but one element in the energy consumed in producing oil and gas off-shore, but the iron ore and coal needed to produce it turns out to be the limiting factor. The analysis above can only be considered "ball-park" and needs refining by the off-shore industry professionals. The world currently consumes 30 billion barrels of oil plus another 20 billion tonnes oil equivalent of gas, so off-shore oil can only provide a quarter of current consumption, which is in turn limited by the continuing availability of iron ore and good quality coal. The availability of steel scrap is also a factor.